Although temperatures are dropping and the leaves are changing, this is the season of the foodie. To celebrate, we’ve rounded up some of the best menu items being served in the “Hub City” this fall. From healthy to heartwarming, they’re all delicious and perfectly capture the best flavors of the season. If you aren’t a morning person, one visit to Hub City Nutrition and they’ll make every morning better than the last. As soon as you walk in, you’re greeted with friendly faces, big smiles and a huge wall that features all of their new and seasonal flavors. They’ll know if you are a new customer because they’ll ask for your name and never forget it. Grab a ticket and fill out your order; your shake of choice, your flavor of aloe, and the size for your tea. This season we recommend a hot pumpkin macchiato with 21 vitamins and minerals, 24 grams of protein, 5 grams of fiber, and 200 calories. All shakes are made from plant protein, made to order based on personal preference, food allergies and sensitivities. 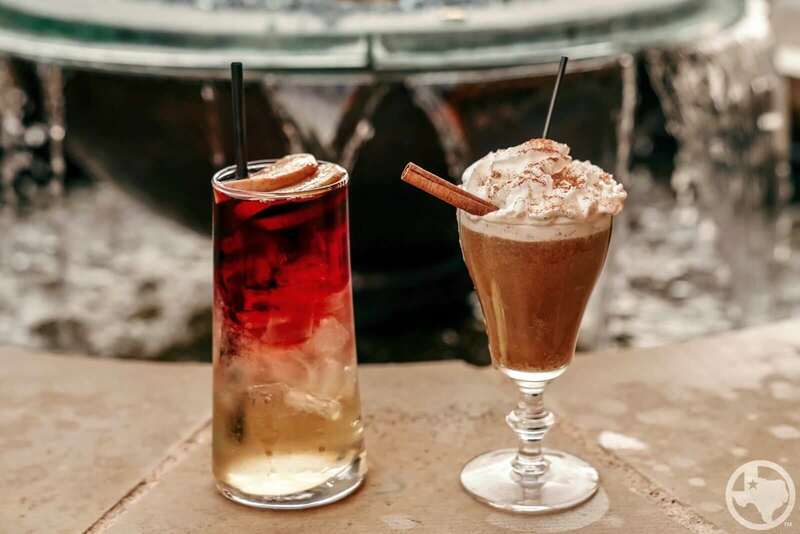 If you’re looking for a fall cocktail, settle into a chair at The Funky Door and let them do the rest. The atmosphere is lively but dimly lit which brings a certain calm over the chaos of the bustling restaurant. On our last visit, we had our bartender whip up something called October’s Very Own, made with vanilla cinnamon-infused bourbon, pumpkin Bailey’s, house caramel syrup, freshly pressed coffee and garnished with a swirl of whipped cream and a sprinkle of cinnamon. Grab one of these, head on out to the patio and get cozy with a fire pit to watch a classic west Texas sunset. If you’re in the mood for something on ice, they’ve got just the drink. Apple of My Eye is crafted layer by layer with vodka and ginger liqueur, house-made apple cider, then topped with merlot until the glass is almost overflowing. The bartender then reached for a jar filled with homemade candied apples and meticulously placed a few slivers on top; it all mixed so perfectly together like a fall sangria. At the bottom of the drink, I had to fish out those apples and they were everything I hoped they would be; sweet, sticky goodness with a soft crunch. This little hideaway is covered wall-to-wall in soccer memorabilia but it skips the classic sports bar fare in favor of a seasonal menu filled with handpicked ingredients and tender loving care. Their fall menu features specials that will warm your heart with the fire of the fall. 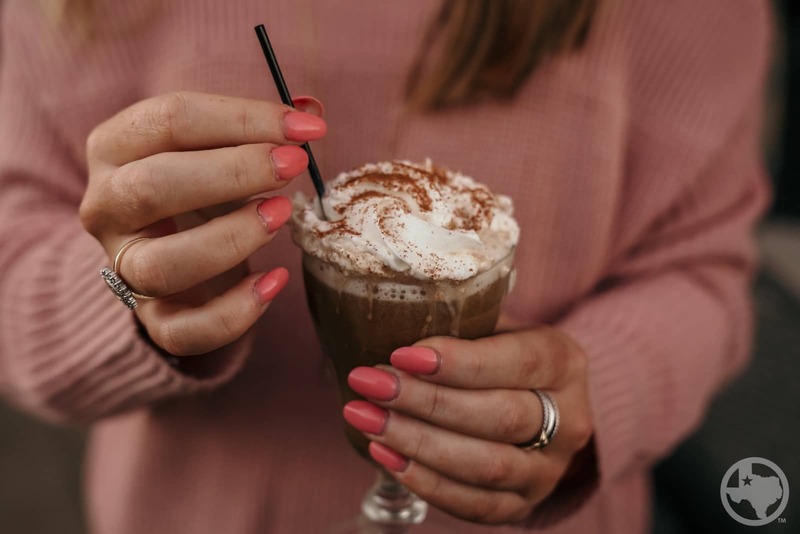 My personal favorite thing you’ll find here is their attention to allergies and other food restrictions with labels for their gluten-free and vegan options, with quite a few food allergies myself, this is a very large concern for foodies. 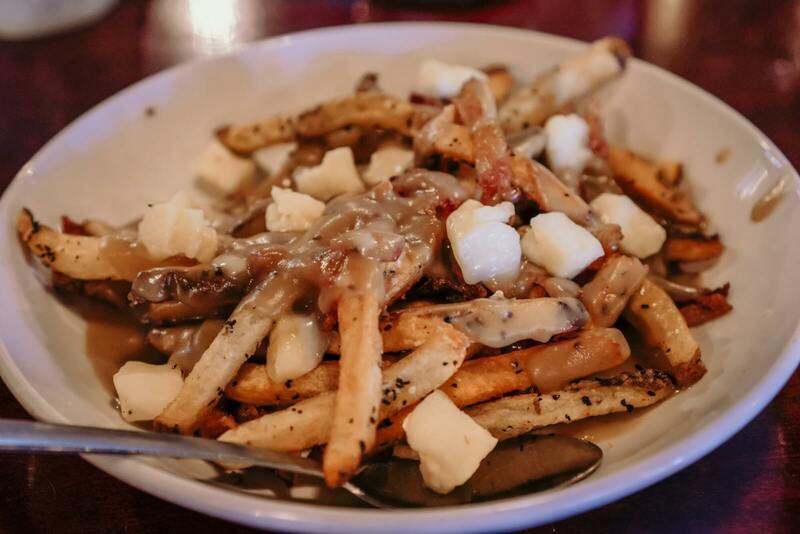 We started by diving into their poutine, fries twice fried and drenched in brown gravy, fresh cheese curds that begin to melt as soon as they hit the gravy and apple-smoked bacon. 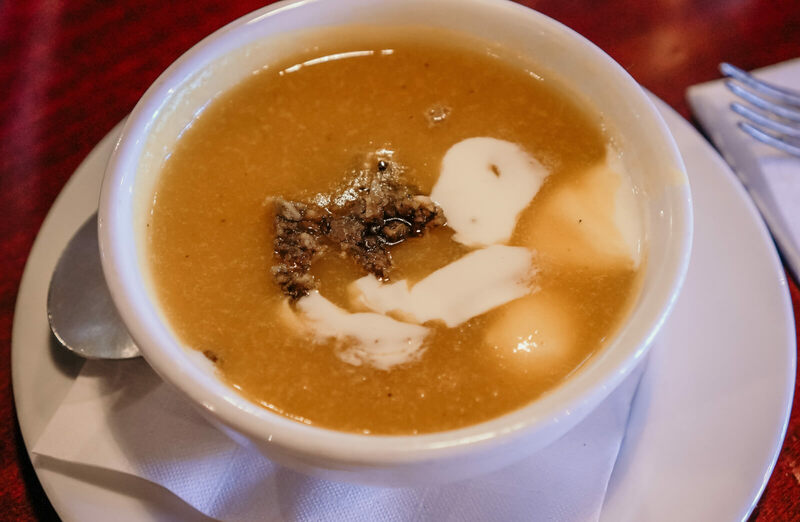 We wiped the plate clean then dug into a hot cup of pumpkin soup that was every-kind-of creamy and topped with shishito pipian. Whoever made cranberry mostarda is a genius, but Crafthouse goes one step further and adds it to a turkey pastrami sandwich on dark rye with their house chips that will satisfy all of your salty crunchy cravings. 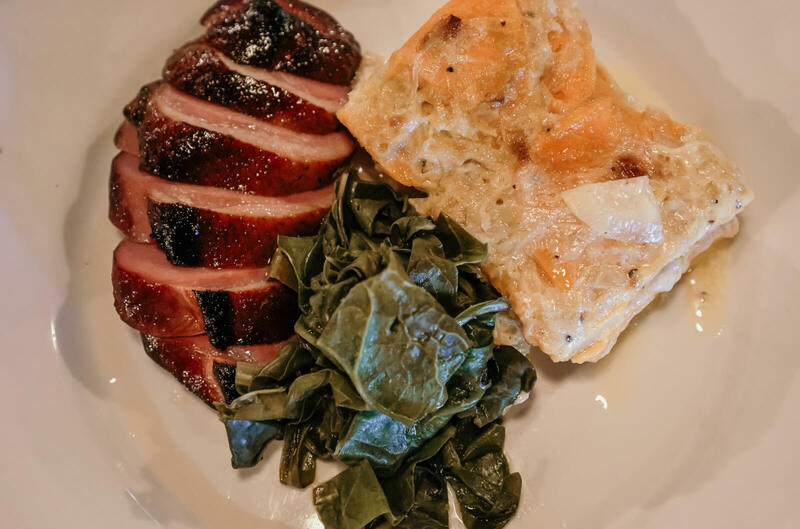 If you’ve never had duck, like me, this is the time to branch out. Drizzled with a spiced honey glaze, this cured and smoked duck breast looks like a mini Thanksgiving ham. It was served with sweet potato au gratin that made me question why I had never put cheese on my sweet potatoes before and a helping of cider-braised greens. Calling all foodies for this revolving menu that changes daily! Located in downtown Lubbock, The West Table is waiting to satisfy any and all cravings. Stand outside of this building and you’ll be able to smell every flavor being cooked up in the kitchen. I started with a glass of The Cleaver red blend from the central coast of California which paired so nicely with the white chocolate mousse, topped with perfectly roasted pineapple niblets. If that isn’t enough sugar for you, we did a double take on dessert because we just could passed up the cream-stuffed sopapillas, topped with a raspberry drizzle. We’d love to hear which restaurant has your fall favorites in the “Hub City!” Share your photos with us on social media using #LiveLoveLubbock #VLFoodieFavs and happy dining!